Join us for an entertaining weekend at the beach while supporting a worthy non-profit charity, K9s for Warriors! We have an event-filled dog-friendly weekend planned with something fun for everyone while raising money to support this important charity that obtains, trains and provides service dogs for our Veterans in need. 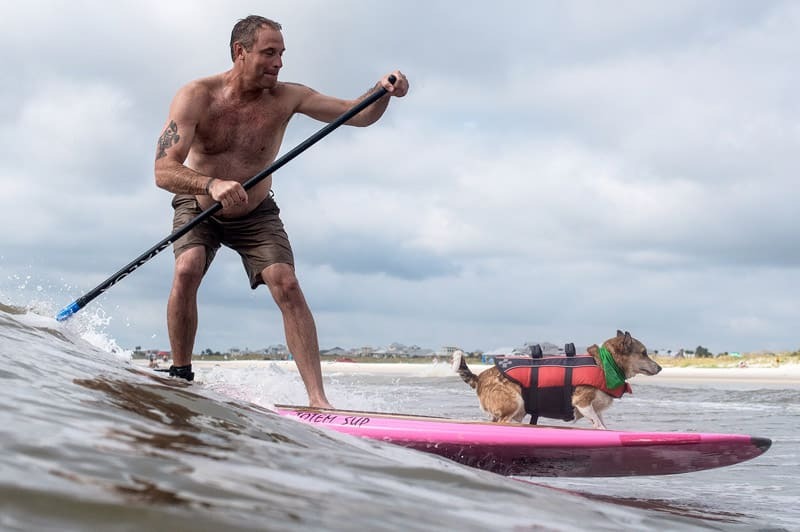 We will have dogs surfing, paddle boarding, a pet costume contest, a surfboard grommet art exhibit, and don’t forget “Yappy Hour” and kibbles as well as a Surf Village with Hospitality Tents. 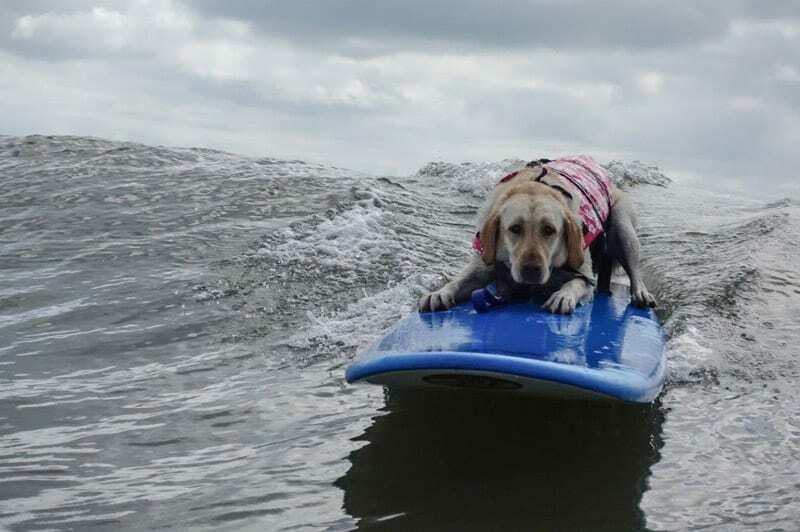 So, grab your boards and furry friend and celebrate a weekend of Fun in the Sun while giving back to K9s and our Veterans! Don’t miss out! Meet & Greet Yappy Hour & Costume Contest – Join us with or without your furry friend for cocktails & kibbles at Santiago’s Florida Kitchen & Craft Bar located at the Guy Harvey Resort. Meet other competitors, or just relax and enjoy. 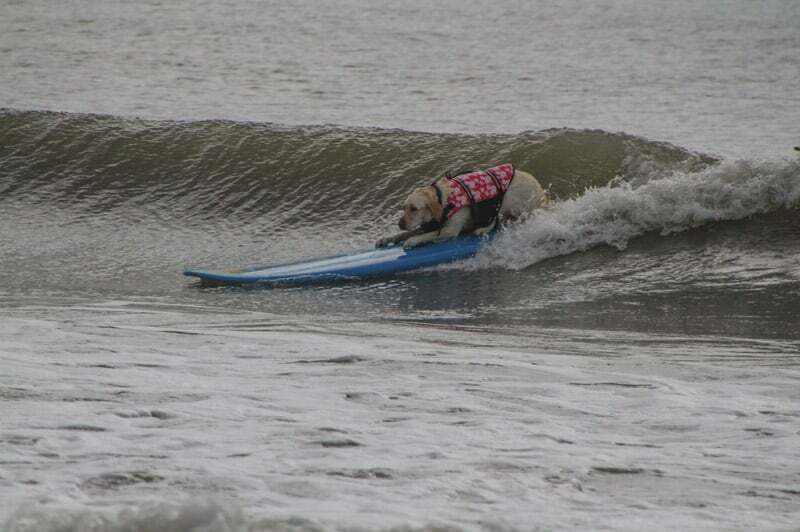 Also, Check-in & Late entry registration for dogs in the surfing or costume contest. For the Costume Contest dress up your 4-legged friend and take part in our doggy costume Pirates & Mermaids theme contest. Prizes and fun while we raise $$ for a worthy cause. 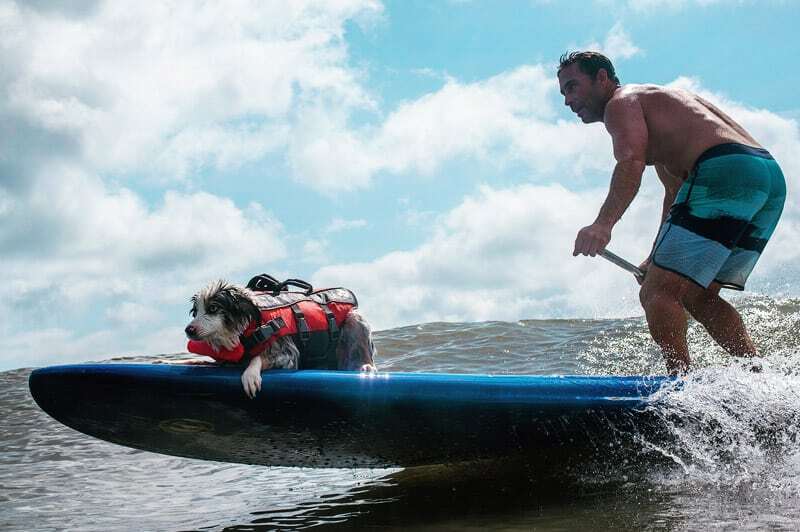 Hang 20 Competition – Hang 20 Dog Surfing/paddle board Event. Complimentary boards will be provided by the Surf Station for those registered. 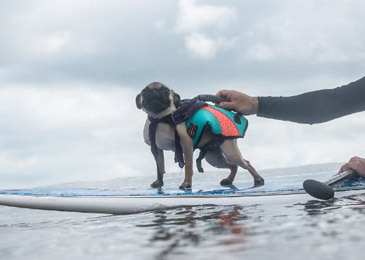 Beginners welcome as NO EXPERIENCE IS NECESSARY just a life jacket for any dog on a board. Sign up early and save! Pay $20 entry fee (donation) today vs. $35 after July 1st. PLUS, sign up now and receive a Hang 20 commemorative shirt as your gift and an “all access” events wristband, while supplies last. Dress up your 4-legged friend and take part in our doggy costume Pirates & Mermaids theme contest. Prizes and fun while we raise $$ for a worthy cause. 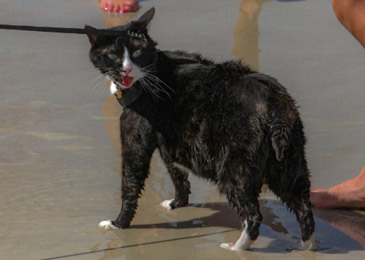 Yes, bravery comes in all forms, including this brave cat that attended our Pups & Sups event last year! Attendance is free. All are invited. We do ask you to donate directly to K9s for Warriors, here is our online link to do so. Thank you for your support! Guy Harvey Resorts is a proud supporter of K9s for Warriors. By simply sponsoring, registering for the event, or participating as a tent host, your contribution will make a difference. K9s for Warrior rescues, rehabilitates, trains and provides service animals for returning military personnel with Post-traumatic Stress Disorders. These hard-working people and the dogs they provide are dedicated to helping our Military warriors return to civilian life with dignity and independence. 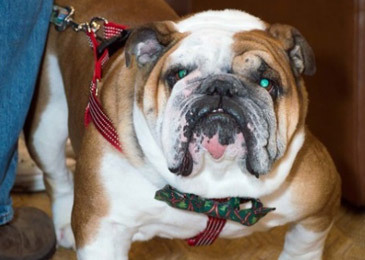 They are the nation’s largest provider of service dogs for disabled American Veterans. Whether you par t i c ipate via competition, donate your time or money, or simply join us for a fun day on the beach, your support is greatly appreciated. Find out more at www.K9sforWarriors.org. Check-in Time : 8:00 am-8:45 am. Please be prompt as we will not check-in anyone arriving after 8:45am. Everyone competing should stay in or nearby the Surf Entry Tent with other participants until your Heat division is announced. 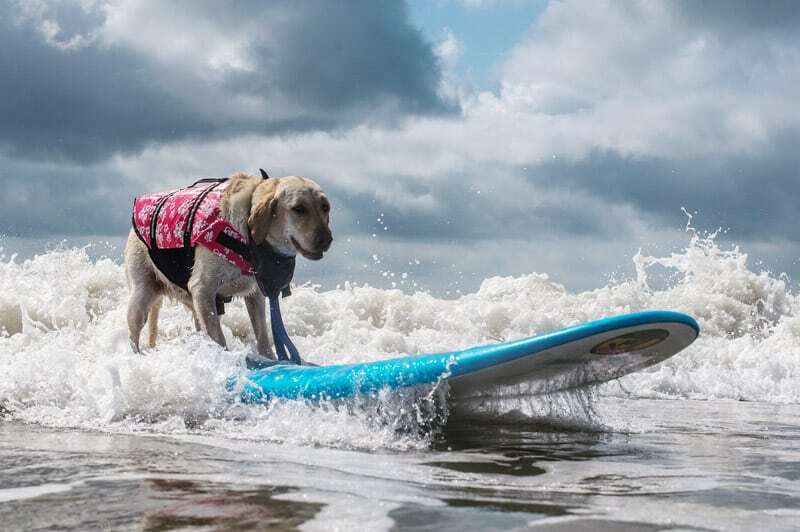 All surfing dogs must have one person in water with PAWticipants and one person on shore to “catch” them as their ride is finished. There will be volunteer handler to assist. If you are alone and need a volunteer handler, please let us know when signing up. Dog must wear flotation jacket (will be provided if needed) with identifying bandanna. 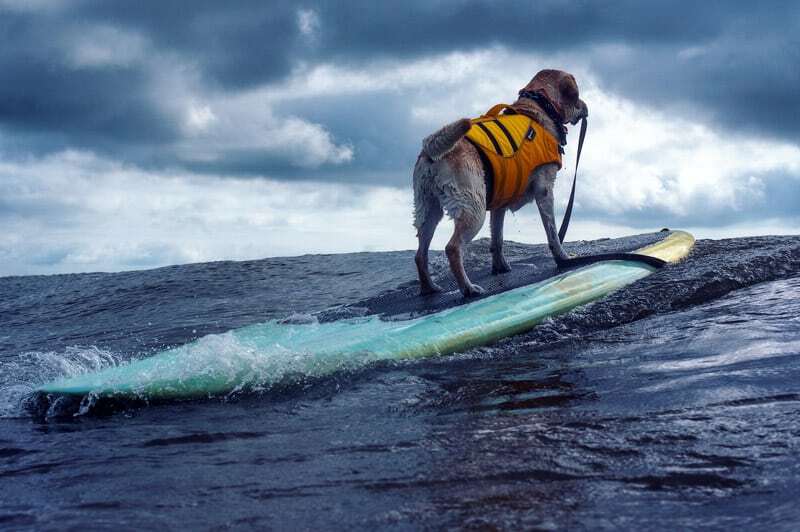 Upon your dog completing his/her ride, please kindly exit the surfing zone to make room for upcoming competitors. Water Support Teams : To make sure the judges can see the action and score dogs accordingly, each PAW-ticipants will be allowed: Team of Two ~ (1) handler/launcher and (1) assistant/catcher. 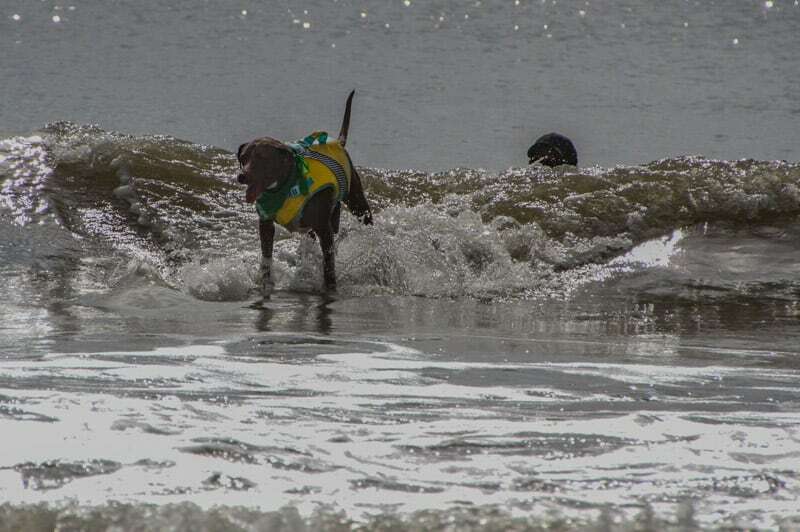 In addition, a volunteer will be available for catching dog’s closer to shore. 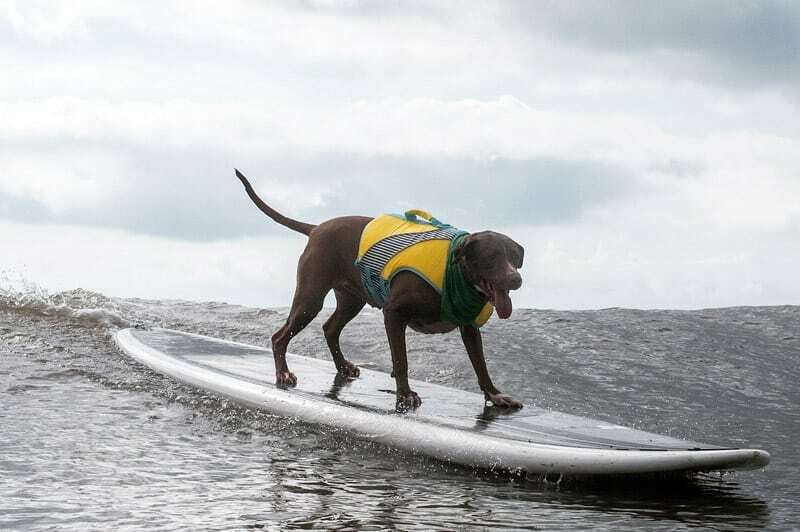 Volunteer will meet you and your dog before each heat; owner /handler will plan on how to handle the dogs and retrieve the surfboard and re-entry into the waves. Volunteers will assist in catching dogs as they come in. If no assistance is needed please kindly inform the staff. 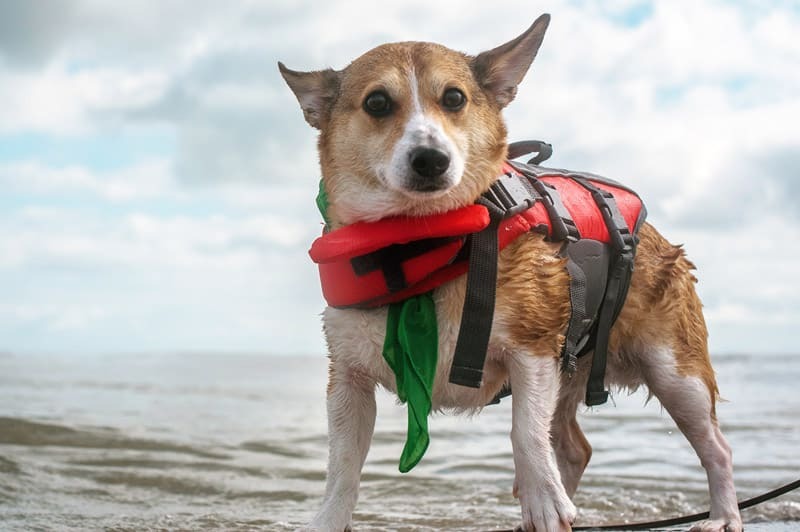 Equipment : All dogs MUST wear a flotation device while competing. NO EXCEPTIONS PLEASE. This is for the safety of all PAW-ticipants and their team. All dogs, must wear contest-provided Bandanna so they are visible by judges. Leashing dogs to the board is prohibited. Dogs must be under Owners’ control at all times. We reserve the right to disqualify from our event any unruly, ill-behaved or (hopefully not) aggressive dogs at our discretion. So please remember this is meant to be a fun, safe event for everyone involved. Heats : Each heat will begin and end with one long horn or whistle blast and display of a green flag. A 2-minute warning will be given. At the conclusion of the heat, competitors will immediately exit water and return board in preparation for the next heat. Scoring/Judging Criteria : We welcome “first-timers”. We want this to be a friendly and fun competition for the teams. For that reason, not all our prizes are based upon surfing/paddleboard skill. In fact, some are based on just plain ole luck! Judging criteria will include: Best Sur-fur, Longest ride, Best Trick on Board, Best WipeOut, Most Photogenic, and Crowd Favorite. 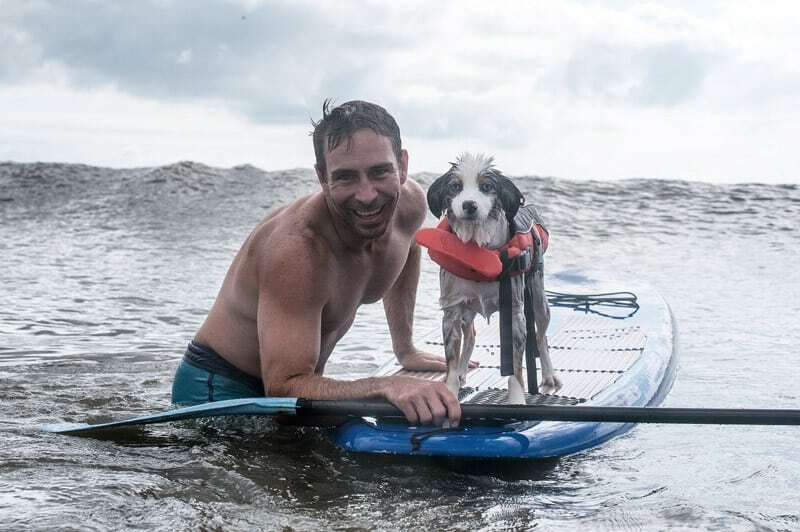 So dogs and owners, grab your Balls and Boards and come along to learn something new. Surf Etiquette : Please be respectful of everyone around you. SAFETY COMES FIRST : No Interference /snaking: Positioning himself or herself in front, around, or behind a competitor to impede and take wave possession is known as snaking. Any action that impedes a contestant riding or taking off on a wave, in front of the rider in possession will result in an interference call. In cases where a rider is in front of another unknowingly, or so appears, to judges, no interference shall be called. If you see any dawg or person in trouble please help them first. Safety is our first priority!!! Unsportsmanlike conduct will be cause for removal and disqualification from contest. This would be outburst or intimidation of other PAW-ticipants and /or spectators, volunteers, judges and organizers. 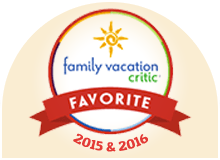 This is a family fun event and we value and respect our participant, sponsors/vendors, volunteers and judges. We request the same respect for all the attendees in return. Awards ceremony will be at 11:30AM or immediately after judges have tallied scores and will be held at the beach.